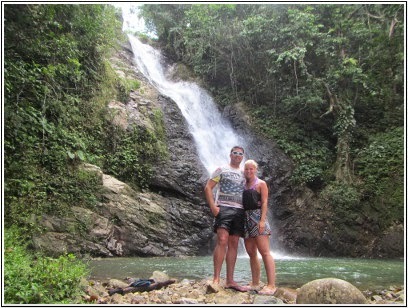 Damo and Vikki's Round the World Trip! 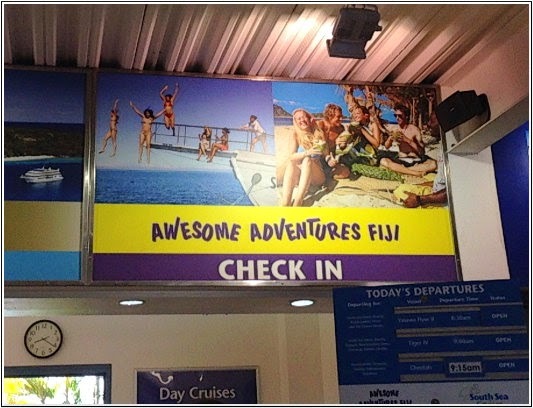 : Fiji Highlights! 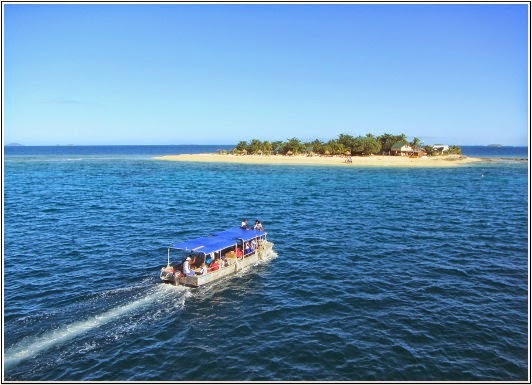 We spent a month in Fiji in May 2014, visiting Nadi, the Mamanuka and Yasawa Islands and the Coral Coast. A month is definitely way more than we needed but it was awesome to have time to chill after a crazy month in America! 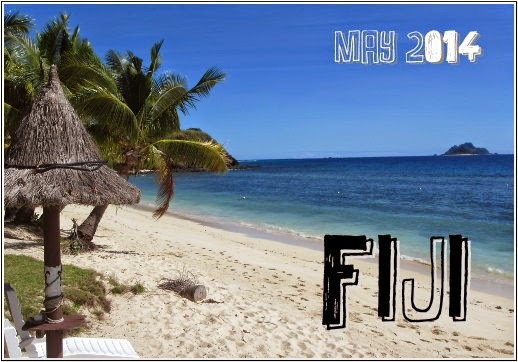 We left LA at 11.30pm on 30th April, and because we flew over the international date line, we arrived in Fiji at 6am on 2nd May! We arrived at the Nadi Bay hotel and even though it was really early they had a room ready. So we went to bed and woke up 3 1/2 hours later, and it felt like a new day and we didn’t have to worry about jet lag! Most people only stay at Nadi Bay for 1 night before heading off to another part of Fiji but we spent the first 6 nights there before our island hopping trip, it was so nice to just laze around the pool, watch films on the laptop and chill! On one of the days we caught the bus into Nadi town which cost 70 cents! We must have really stood out as being tourists as loads of people were trying to talk to us. I had read on the internet to just ignore them, which I was doing well at, until I turned round and realised a man was persuading Damo to come into his shop, and he was being too polite to say no! So we arrived in the shop and they got us to take part in a traditional Kava ceremony - basically sitting in a circle and drinking what tastes like mud from a coconut shell! They then tried to get us to buy things from their shop! 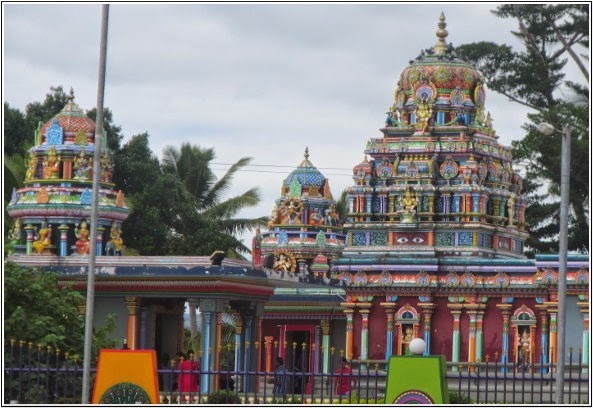 It was cool to see the town but it wasn’t very big, there was a really colourful Hindu temple at the end of the main road though which was worth seeing! We booked our island hopping trip with Awesome Adventures. 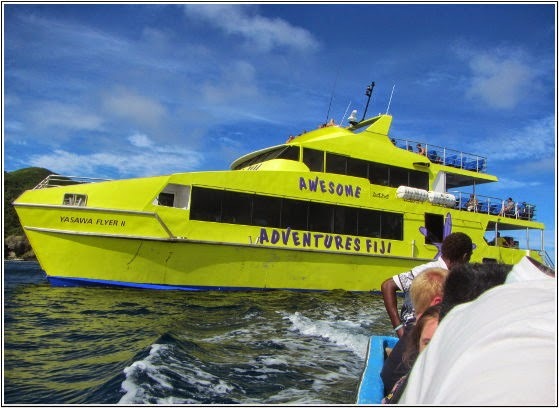 It was a 12 night trip called ‘Tropical Awegasm’ and we went for the ‘full monty’ option which included accommodation, food, activities and transfers between the islands on the bright yellow Yasawa Flyer boat. The start of the trip was so stressful, we got picked up from the Nadi Bay hotel and transferred to Denarau Marina, except the first bus that turned up couldn’t fit us all on so it drove off and we were left to wait for another one! When we arrived at the marina we were told to go and check our suitcases in first, and they put a label on our bags with the name of the first island we were visiting which was Beachcomber. We then had to queue up, we were still in the queue at 8.25 and the boat leaves at 8.30! Got given our vouchers and found out that our first island had been changed to Bounty island, argh!! Also got told that the ‘Seaspray’ trip (to Monuriki island, the one from the film Castaway) wasn’t running at the moment, so we had a trip to Mana island instead, but the voucher for it would be sent on the boat tomorrow!?! I was just so concerned about missing the boat and our bags ending up on another island so I nodded and ran to get the labels on our bags changed to Bounty!! We somehow made it onto the boat and it only took about 35 minutes to get to Bounty Island. From the Yasawa Flyer, we had to jump into a really small boat to take us to the island, and our bags were thrown onto the small tin roof on the top of it! I was terrified they would slide off into the sea! It was only the two of us and one other girl, Claire, who was also from Southampton!! The island was so small that you could walk around it in 20 minutes, which we did that evening. It was also the place they used as Celebrity Love Island, but I never watched that programme! The accommodation was so basic, pretty much a hut with a bed, bunk beds and a fridge, and the bathroom attached to the back! The island was so beautiful though, and there was a pool and a big inflatable trampoline in the sea, which we had loads of fun on! 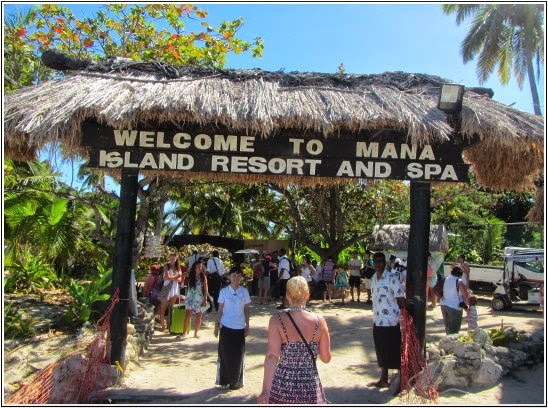 The following day was our day trip to Mana island (the one that we knew nothing about!) The people at the resort had told us the boat leaves at 9am, so we went for breakfast at 8.15 and waited around… it got to 9.30 and after being convinced we’d missed the trip the boat finally arrived! And our ticket was on the boat! Pheewww!! Arrived at Mana island to a big group of people singing, got given snorkel gear and shown a map of the island, then we were free to go off and do whatever we wanted. We headed to the other side of the island and the snorkelling was amazing, we got further out and reached a flag in the water which seemed to be a marker for where the depth of the water dropped and there were hundreds of fish! We took some photos with the underwater camera, then went for lunch which was a really nice buffet and we met a lovely family from Melbourne who we chatted to for a bit. We then headed over with them to the other side of the island, where the water was a lot calmer. 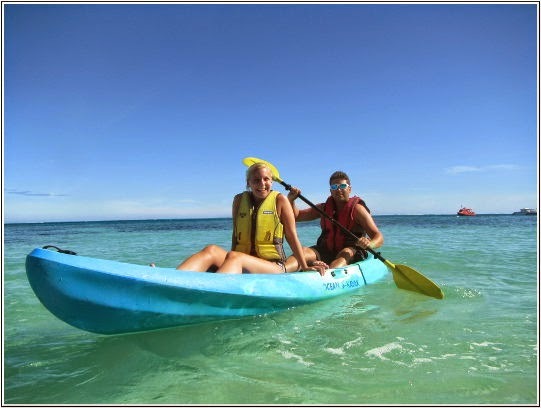 They had kayaks so me and Damo went out on one, we then went snorkelling with the girls from the family we had met and saw loads more fish. Mana island was so beautiful and we had a brilliant day there!! We said that when we make it to Melbourne we would contact the family and try and see them again as we got on so well, and hopefully we still will! The next morning we left Bounty island for our next island which was called Waya Lailai. This one took about an hour and a half to get to. Once we got to where we get off the boat, the boat that took us to the island was TINY!! The water was also a bit choppy so we got completely soaked and so did our bags! We got checked in and our ‘bure’ as they call them was right on the beach. Our vouchers for this island were a guided summit walk and snorkelling with sharks! Activities didn’t run on a Sunday and it was a Saturday, so we did them both! The snorkelling trip was first, we got on the boat (the same one that had picked us up) and it felt like we were on it for ages, I was a little scared about how far out we were heading! We finally arrived at the reef and all jumped out the boat into the water. 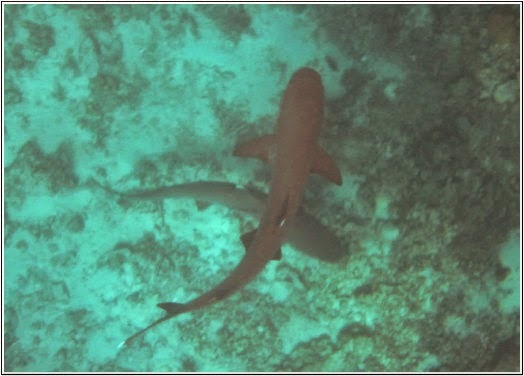 Saw a few fish, then spotted the sharks! They were only small reef sharks and the guy who was our guide from the resort was diving down and grabbing them and bringing them up! On our way back on the boat I felt like I was going to spew! We then just about had time for a quick shower, which was cold! Then it was time for the guided summit walk. It was SO hard!!! We had to scramble up rocks and really steep tiny pathways, I was a sweaty mess! It took about an hour to reach the top, which did make the climb worth it as the view was beautiful! We watched the sunset from up there, then it was time to go back down, I thought that would be the easy part but it was just as bloody hard!!! I kept slipping and thought I was really going to injure myself! We finally made it back then went for dinner, and sat with a couple from England who had also done the hike with us and another couple we had met earlier. 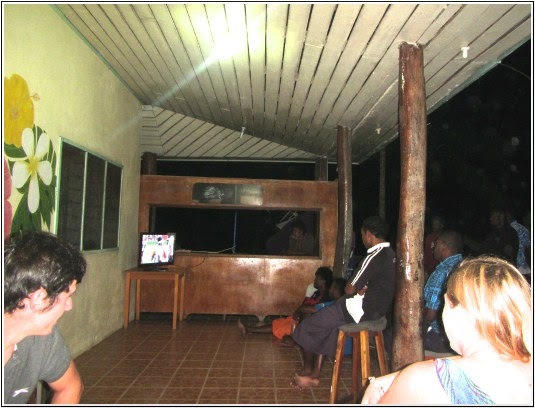 The staff put the rugby on, on a tiny TV they had set up as it was Fiji vs Spain, and they were all going nuts for it! They are Rugby mad here! The next morning I woke up and heard something running around in the room which really freaked me out, it was just a gecko though, which I don’t mind! But I then spotted the biggest cockroach I have ever seen laying on it’s back with it’s legs in the air wriggling about! Ewwww!!! The next island after Waya Lailai was Coralview. This one is right at the top of the Yasawa islands, and it took about 3 hours to get to. When we reached the island and got onto the small boat, it started to leave and we could see our bags still on the big boat!! Luckily they realised and went back to get them!! We got checked in, did a bit of kayaking, decided to do the ‘sunset hike’ up the hill but when we were almost at the top there was a huge spider in a cobweb right across the path! So I freaked out and went back down!! The following day we had vouchers for massages which were amazing! 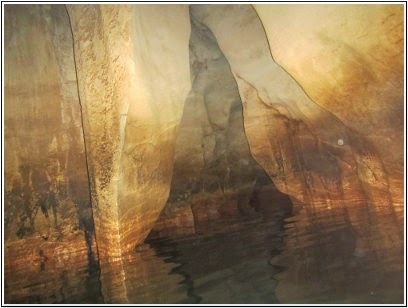 Our other voucher at Coralview was for Saw-I-Lau caves trip. This one had a waiver we had to sign, and we weren’t really sure what to expect! A boat took us to the caves and we had to walk up some steps and then down some steps to get inside. We then had to jump into the water which was really cold! It was fun but kind of weird not knowing if anything was in the water with you!! 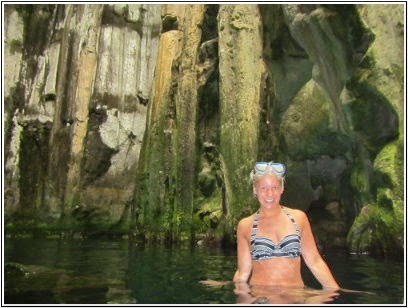 The second part was to venture into the 2nd cave, which you had to swim underwater through a narrow tunnel to get to. I didn’t do this part but Damo did! They swam around in the 2nd cave which he said was pitch black so I didn’t miss much! When we came out of the caves there were a few little market stalls to look at, the driver of our boat was asleep on the beach and snoring! Damo took a photo of him and all the stall owners wanted to see the picture and found it hilarious! 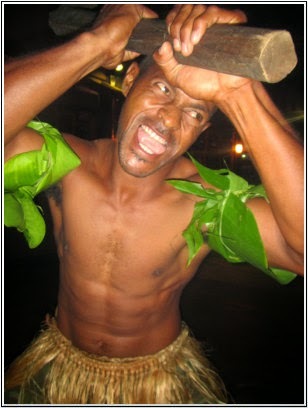 The Fijians are just so happy and smiley all the time! After the caves trip it was time to head to our next island, called Korovou. We met loads of people on this island, at dinner that night we chatted to two English girls, one being a carer and the other a stripper! 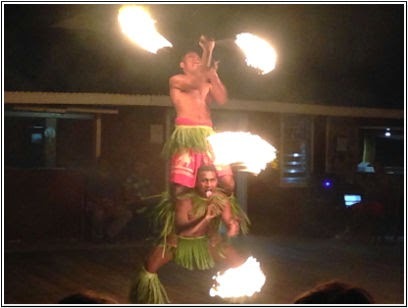 They had a bit more entertainment than on the other islands we had been to so far, and that night it was 'Fijian dancing’ which was basically like the party dances which we used to do at work, they then did some fire dancing, then we all played a game of potato relay! Our team lost so we had to perform the “Bula dance” for the other team! We then stayed up late playing tons of random drinking games followed by a game of baked beans (like hide and seek but when you find someone you hide with them) before heading to bed as we had a trip to swim with manta rays the next morning! 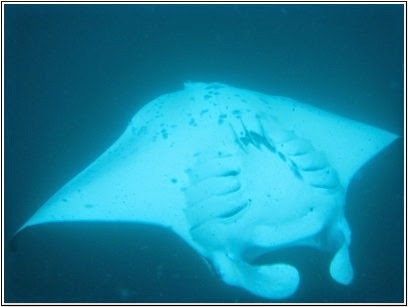 The next island resort was actually called Manta Ray, and it was just a short journey from Korovou. Once we had checked in here we went snorkelling with Dan and Ed who we had met at Korovou, and it was awesome, we saw so much beautiful coral and so many fish! That night we had a few drinks and watched the show that they put on which was Fijian dancing and singing. At one point they came at us doing some scary war type dance and I took this photo of the guy up in my face!!! Ha! After the show we played some card games and beer pong before heading to bed. The following day it rained really heavily literally all day! We had the manta ray swim today but unlike at Korovou, where it was at a set time, they wait til the manta rays are spotted then bang the drum! 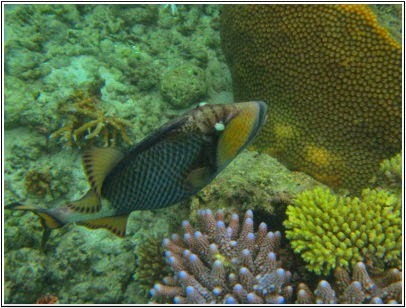 When you hear it, you grab the snorkel gear, jump on the boat and go! We woke up at 6.45am as we knew the swim was usually before breakfast. We listened out for the drum but the rain was so heavy that we guessed they might hold off for a bit, and it got to 8am so we went for breakfast, which was really nice and had loads of choice! 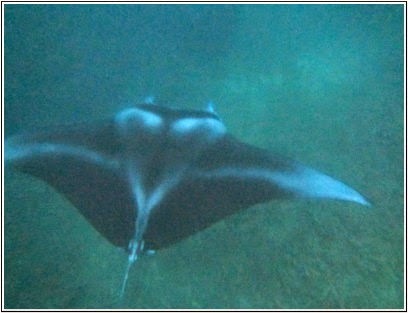 We had literally just finished eating when they said it was manta ray time! Oops maybe I shouldn’t of ate all those pancakes…! We sped off on the boat and jumped in the water and there were so many manta rays this time, they were right there barrel rolling just underneath us! They are so so big and I did find it kind of scary at first, but it was and still is one of the best experiences of my life!! 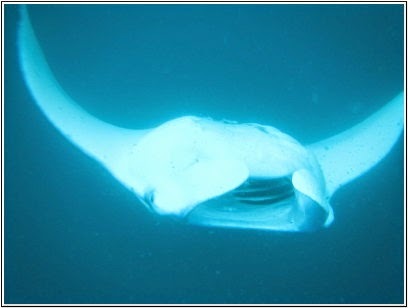 Manta ray season is from May to October, and if you are planning a trip to the Fiji islands I would totally recommend you go during this time if you can!! The day we left Manta Ray the rain had finally stopped, but it was still really windy, making the sea really choppy so we couldn’t go snorkelling. When it was time to leave, we had to board the boat from the other side of the island due to the water being so choppy. We had to wade into the water to make our way to the boat and my feet were starting to slip out of my flip flops so I took them off, then cut my feet on the coral! I also managed to end up waist-deep in the water before I got on the boat! We then had the roughest journey ever on the flyer, I felt sea sick the whole time, was soaked, and in a mood! So I made myself fall asleep! I did end up sitting next to a girl called Sunny though, who we had met at Korovou! She was telling us that she was chatting to some people on another island about all the different people you meet and the jobs that they do, and they said they had met some holiday park entertainers! She was like, “yes Vikki and Damo, I know them too!” Haha. Our final island which we reached at about 6pm was Beachcomber, which we stayed on for one night, and was back down in the Mamanuka islands, a lot closer to Mainland Fiji. It was another small island, similar to the size of Bounty that we had stayed on first. It has a reputation of being the party island but it was pretty quiet the night we were there, we watched a crab race where people bid for the hermit crab they think will win, then just headed back to the room. The following morning we headed back to the mainland, our Awesome Adventures island trip was over but we were now heading down to the Coral Coast! 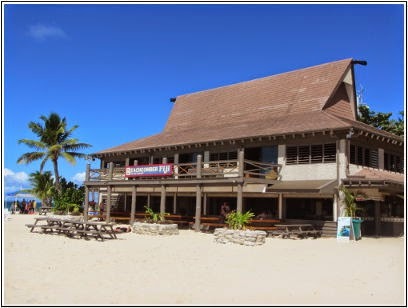 We stayed at a resort called Mango Bay for 10 days, which was about an hour and a half drive from the port. 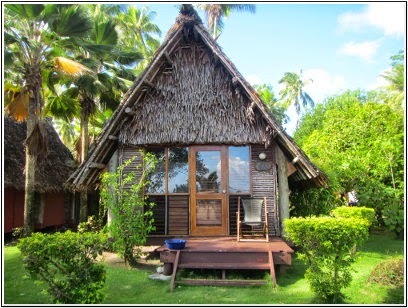 We had a beachfront bure which was similar to the ones we had stayed in on the islands, except the shower was outside in a little garden! No one could see you though as it had walls all around it! 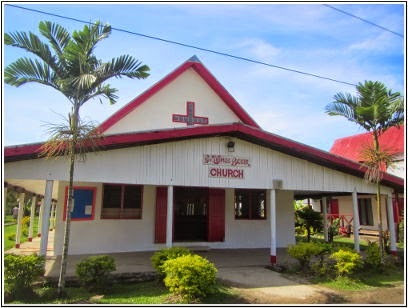 While we were at Mango Bay we went snorkelling, kayaking, made coconut jewellery, went on a sunset booze cruise, on the Sunday we visited the local village for a church service! We were the only tourists there and we didn’t know what to expect but it was free so we thought why not! It was all in Fijian so ended up getting very boring! The local villagers seemed to really appreciate us coming to it though. On one of the days we went on a waterfall hike, where we were driven to a village, then did a kava ceremony as a welcome to us. We then made our way to the waterfall. We had to cross a river lots of times and some parts were really muddy as there had been some heavy rain. I almost lost a flip flop in the mud twice! We reached a waterfall and it was beautiful!! 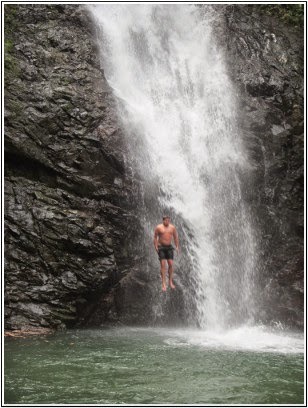 There were some crazy Fijian guys climbing up the rocks and jumping in from really high up! We were given some bread to feed the fish and Damo went in for a swim, I didn’t because it was freezing!! Damo and another guy we had met, Ardon, were climbing up and jumping in. After our 10 days at Mango Bay, we got a transfer on the TTF bus back to Nadi Bay for 2 nights before our flight to Auckland, New Zealand! I would definitely recommend all the places we stayed, Awesome Adventures weren't perfect but the experience we got and the places we saw were amazing! If you are planning a trip to Fiji you should definitely try and get out to the islands, even if it's just for a few days. Awesome Adventures have a website here if you want to find out more. If you have any questions about anything let me know or leave a comment below, I'll be happy to help! !